Our AGM is being held at the Bowls Club next to the Tennis Club on Thursday 28th February 2019 at 19:30. Everyone is welcome so please come and hear about upcoming events for the year, important matters to the club and support the committee. The AGM is a place where we can make improvements to the club where we can! All memberships are coming up for renewal on the 1st April. If you are planning on re-joining for the next year or are planning on joining as a new member, please make sure you do this ASAP. If you join before the 30th April, you get a £10 discount! We run children's tennis sessions on Saturday mornings between 10:00am-12: 30pm. These are open for children of all ages and abilities! We run an Adult skills & drills session Monday evenings 18:30-19:30 for all abilities. Use the contact us tab to find out more! Come along to social tennis on Tuesdays 10:00-12:00 and 18:00-21:00, Thursdays 10:00-12:00 and Saturdays 14:00 onwards. If you are looking to join us as a new member, these are the perfect way to start! You can come along to any of these for free on your first visit before you join to test the waters. Use the contact us page if you are interested! Click the drop down menu under our ‘What’s on’ page to find the dates for this years tournaments and events. Our online court booking page is up and running. Please book your courts through here to secure your space. 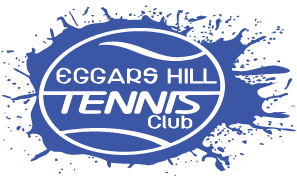 Our club is a thriving and friendly local tennis club accessed via a small lane from Eggars Hill towards the South of Aldershot. There are three all-weather courts, two of which are equipped with floodlights. We also have a clubhouse and pleasant gardens. More importantly we have a lot of enthusiastic playing members which means there are plenty of people to play with all year around. Our senior teams compete in the Aldershot and District Lawn Tennis (ADLTA) summer and winter leagues. Alongside the leagues, we have a number of inter-club tournaments and championships open to all members throughout the year. There is also a fantastic coaching programme consisting of group sessions for young people starting at age 5, through to adult coaching which is run on Monday evenings for those looking to get back into playing or just wanting to brush up on some skills. We welcome all ages and abilities, so you’re bound to fit in!